Some chefs are born into the culinary world; Chef Marco Del Core is one of them. 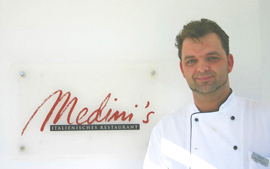 He not only attended culinary school, but also learned cooking from his Italian grandmother and at his father's restaurant in Hanover, Germany, and further honed his craft at a three star restaurant in Sorrento, Italy before joining the Grand Hotel Heiligendamm heading up the kitchen at Medini's. He graciously shares his tempting recipe for Lemon Tagliolini with Shrimp and Sweetbreads to tease your palate. Method: Peel the shrimp leaving the head and tail intact. Add olive oil to a pan and sauté the garlic, and finely cut orange and lemon zest, then add a little chili and salt, half of the fish stock, and the shrimp and let cook. Add the cooked tagliolini and parsley to the pan with the shrimp, orange and lemon and toss together. Cut the sweetbreads in salted water with carrots, celery, and onion. Remove from the water and cut into disks. Sauté them in a pan with salt, pepper, and flour until golden brown. Arrange the sweetbreads on the tagliolini and "buon appetito."